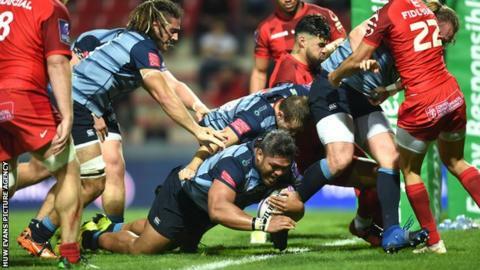 Cardiff Blues sealed a memorable win against Toulouse in the European Challenge Cup to record back-to-back wins in their first two Pool 2 games. Nick Williams crossed to put Blues ahead before Romain Ntamack touched down to level at 10-10 while Antoine Dupont sent them ahead at the break. Macauley Cook helped put the visitors back in front with a try on 51 minutes as Jarrod Evans kicked the extras. Toulouse fought to steal the points late on, but Blues held on to win. Blues went ahead early on at at Stade Ernest-Wallon as number eight Williams powered over from a driving lineout after a quarter of an hour. Toulouse hit back with tries in quick succession for young replacement fly-half Ntamack and scrum-half Dupont as the hosts led 15-10 at half-time. Blues showed real character to hit back in the second half with flanker Cook crossing for the vital score, with fly-half Evans' kicking securing a memorable win. "I thought our players were outstanding. To come out and guts it out at a venue like this, against a team like this, was superb and that's with a lot of young players out there as well. "The boys showed huge character and commitment to show what a tight group of players they are. "That second half was mainly us. We held territory and possession and will probably look back and say we should have scored a few more points, if I'm honest." Cardiff Blues: Matthew Morgan; Alex Cuthbert, Rey Lee-Lo, Garyn Smith, Blaine Scully; Jarrod Evans, Tomos Williams; Corey Domachowski, Kristian Dacey (capt), Taufa'ao Filise, James Down, Damian Welch, Macauley Cook, Josh Navidi, Nick Williams. Replacements: Ethan Lewis, Brad Thyer, Dillon Lewis, Seb Davies, Olly Robinson, Lloyd Williams, Steve Shingler, Willis Halaholo.